We all want to do something to help our pets beat cancer. Adding supplements to their diet is an easy thing to do, but with so many available, choosing a starting point is difficult. That’s why today we’ll share three pet cancer supplements vets recommend investigating during treatment. Let your veterinarian know that you want to add supplements to your pet’s diet. You may be surprised at their insight into unconventional therapies. It’s also critical to keep them in the loop in case anything you add interferes with current medications. If your veterinarian isn’t receptive to the idea of pet cancer supplements, or you just want more guidance, turn to the American Holistic Veterinary Medical Association (AHVMA) to find a vet who specializes in holistic medicine. 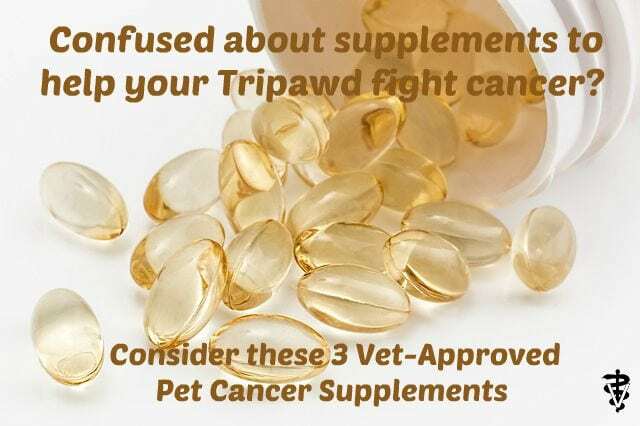 The internet is full of wild claims that certain supplements can cure pet cancer. Before you spend good money on products that may or may not help your dog or cat, carefully research the supplements you want to purchase by browsing blogs and websites written by veterinarians. Two of our favorites resources for pet cancer information are a Path with Paws created by Dr. Lena McCullough and Dr. Demian Dressler’s Dog Cancer Blog. “I don’t use a lot of supplements and single herbs in treating cancer,” writes Dr. McCullough in her blog post “Supplements and Single Herbs for Cancer in Cats and Dogs.” Too many supplements tend to get overwhelming for the pet parent, the Traditional Chinese Medicine practitioner says. But there is one way to stay sane when trying out different pet cancer supplements: rotate them! “In this way we are able to average out the effects so we get an overall benefit that was greater than if nothing was used,” explains Dr. Dressler in his blog post “What is the Best Supplement for Dog Cancer? “. . .use a couple of your big guns, for 2 weeks or so, and rotate to new ones. You can keep the leftover pills for the next rotation!” he says. Here are five supplements that our favorite vets unanimously agree can make a positive impact on pets with cancer. Dr. Dressler recommends taking it one step further and rotating fish oil with krill oil every two weeks. In The Dog Cancer Survival Guide cautions that both oils may act as a blood thinner, so never administer these products ten days before or after any surgery. If your pet is going through chemotherapy, milk thistle can be used to help the liver process and remove chemotherapy drug toxins from the body. It’s one of the more proven natural supplements that vets are comfortable recommending because Milk Thistle studies on human cancer patients have substantiated this claim, and it’s even been shown to enxhance the effect of chemotherapy drugs. Dr. McCullough also says it “can prevent oxidative damage to normal cells.” Keep in mind that milk thistle can be difficult for the body to absorb, which is why Dr. Dressler says he included it as part of his Apocaps dog cancer supplement. Many cheap, Chinese imports have flooded the market in recent years. These products are made with dubious manufacturing processes and ingredients, so please only purchase them from reputable sources such as K9 Medicinals. Before buying any new product it pays to talk with other pet parents who are going through the same experience. Hop on over to the Tripawds Eating Healthy Discussion forum and check out these previous Tripawds Nutrition Blog Posts for more information about pet cancer supplements vets recommend and so much more! I found a great supplement that contains all the mushrooms listed above and it doesn’t break the bank, Mycotaki from MetaGenics. I give my girl one with breakfast and one with dinner.